12 in.18 in.24 in.30 in.36 in.48 in.60 in.72 in.100 cm.200 cm. Radio frequency assembly MIL-DTL-17 BNC male to SMA male right angle cable using M17/60-RG142 coax from Pasternack is part of the largest selections of same-day ship coaxial cables for RF, microwave and millimeter wave interconnect solutions. Pasternack MIL-DTL-17 (also referenced as MIL-C-17) coaxial cable assembly products are used in applications requiring high quality such as laboratory RF test and measurement, rugged and designed for defense / military, telecom antenna tower component jumper connection, production environments, general use, etc. MIL-DTL-17 BNC male to SMA male right angle cable using M17/60-RG142 coax, like our other Pasternack coaxial cable assemblies, will ship the same day and any custom M39012/16-0014 BNC to M39012/56-3109 SMA cable assembly orders will ship same day as well. 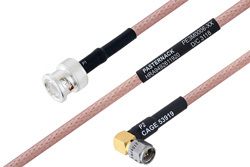 Pasternack RF coax high reliability cable assembly is built with M39012/16-0014 BNC cable connection on one end and right angle M39012/56-3109 SMA cable connection on the other. Our high reliability M39012/16-0014 BNC to right angle M39012/56-3109 SMA cable assemblies have a male gender on end 1 and male on end 2. This M39012/16-0014 BNC to M39012/56-3109 SMA cable is a male to male coax assembly, PE3M0006, can also be known as a MIL-DTL-17/MIL-C-17 high reliability M39012/16-0014 BNC plug to right angle M39012/56-3109 SMA plug cable assembly and will be shipped same-day as it is purchased in most cases. M39012/16-0014 BNC plug to M39012/56-3109 SMA plug cable assembly PE3M0006 is built with M17/60-RG142 which is a flexible coax. The Pasternack flexible M39012/16-0014 BNC cable assembly is manufactured with M39012/16-0014 BNC to right angle M39012/56-3109 SMA cable connectors, has a 50 Ohm impedance and is double shielded. RF specs on this MIL-C-17 4 GHz maximum frequency M39012/16-0014 BNC male to M39012/56-3109 SMA right angle male cable are located on the specifications PDF datasheet on this page along with CAD drawing and dimensions. PE3M0006 can also be used in the other direction and will be right angle M39012/56-3109 SMA male to M39012/16-0014 BNC male cable assembly when used in the opposite direction. High reliability M39012/16-0014 BNC plug to M39012/56-3109 SMA right angle plug cable assembly is just one of more than 45,000 in-stock RF products available. Pasternack is where to buy a high quality M39012/16-0014 BNC to M39012/56-3109 SMA cable assembly for quick shipment worldwide. Variations of M39012/16-0014 BNC cable assemblies can also be built and will ship same-day as well, search this website or contact us for assistance. High quality custom RF cable assembly products for microwave and millimeter wave radio transmitter receiver, antenna jumper, component inter-connection and more for RF test & measurement labs, rugged and MIL-STD designed military / defense, aerospace, telecom, phase stable, phase and delay matching, outdoor and harsh environment and other radio frequency applications can be manufactured. For all these reasons and more, Pasternack is one of the best websites where to find and buy quality RF cable assemblies like this MIL-DTL-17 BNC male to SMA male right angle cable using M17/60-RG142 coax.